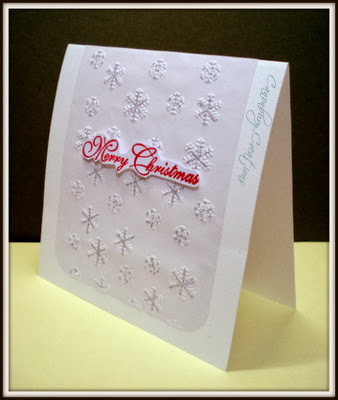 Just a simple embossed panel with glitter on the snowflakes. The sentiment is an SU one with WOW embossing glitter. Not a good photo I'm afraid but it is sparkly IRL! Pretty sparkly card. But sparkle is so hard to photograph isn't it? I always struggle with it. 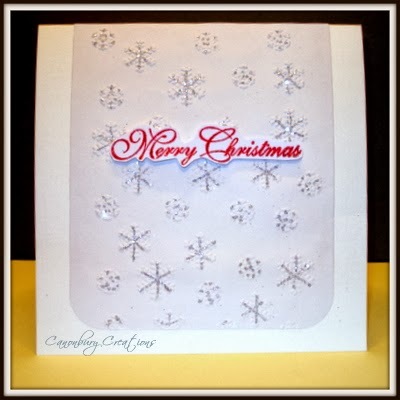 Pretty card Val - snowflakes are lovely. Gosh, shouldn't think you'll need to eat this side of Christmas! beautiful card, val... can definitely tell it is very sparkly!! Soi how was the Ritz then and happy belated birthday. Sounds like a fantastic week and you see to have covered quite a few countries dining out am so jealous ! Oh love the card btw so pretty and sparkly. Oh wow, Val! That is gorgeous and sparkly! Love it!